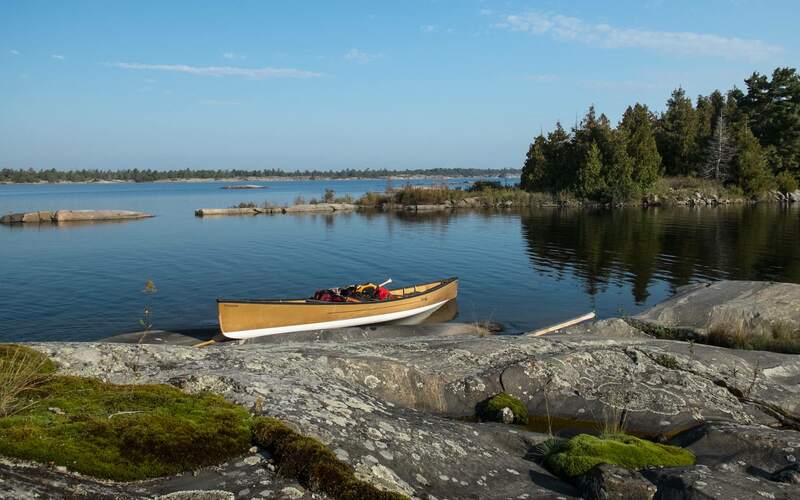 time: 8:30 a.m.; finish 2:15 p.m.
By 8:35 we were on the water for another day of paddling through the maze of rocks and islands along the Georgian Bay coast. 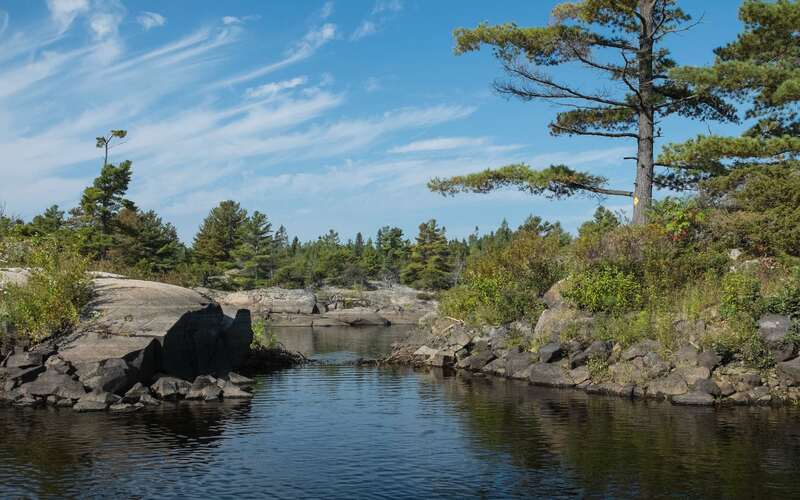 We had as our target the east end of French River Provincial Park and maybe – if we could find a good one – a campsite on one of the Outer Fox islands. If not, there were a number of designated campsites nearby that we could check out. But first – a reconnaissance mission! We wanted to see for ourselves the Bass Creek portages and the route up to Bass Lake. Once there had been a tramway; then there was a boardwalk. We wanted to see what was there now! NB. All maps and images enlarge with a tap or a click or two. On the way, we did stop on Macoun Rock to stretch our legs and fuel up on Gatorade and a Clif Bar. It was just after nine and we were already feeling the heat! To the north of us was Hershel Island, whose east side we paddled along a few minutes later. break time on Macoun Rock just S of Hershel I. By 10:00 we were past Flat Island and nearing Bass Creek. 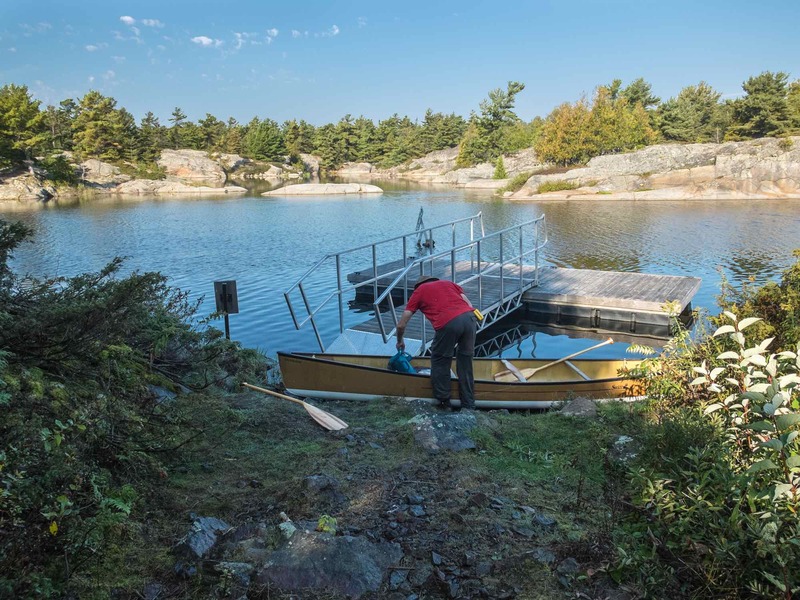 After a 400-meter paddle up the creek from its mouth, we came to the floating dock and the take-out for the 115-meter portage. (See the image below.) Ditching our bags in the bush at the start of the portage trail, we carried the canoe and paddles – and camera bag – to the other end. We’d be coming back in about an hour. As we paddled away from the put-in at the south end of a narrow lake, we looked back and noted the portage signs. They were just two of perhaps eight or nine signs indicating a portage that we would see on our visit! 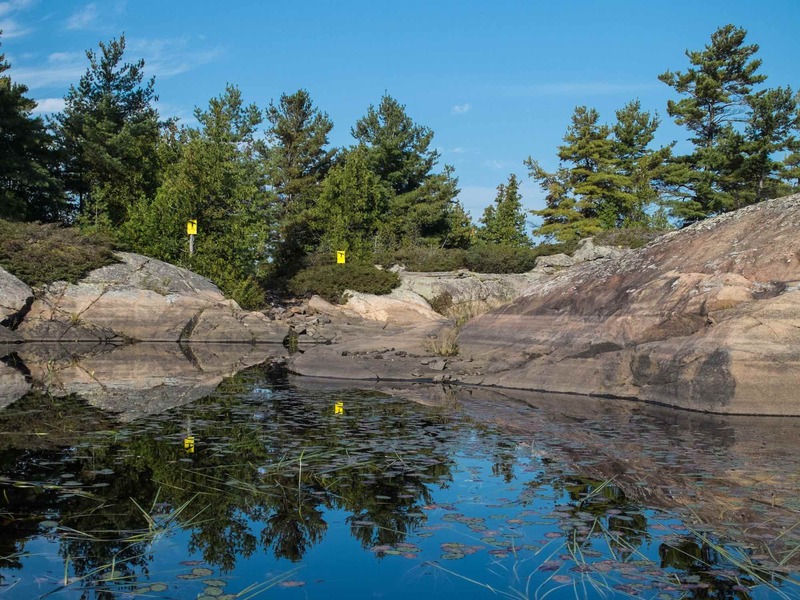 Some – like the ones in the photo above – look like official park signs; others were probably put there by the landowners at the other end who are tired of paddlers tramping across their property looking for a boardwalk that no longer exists! 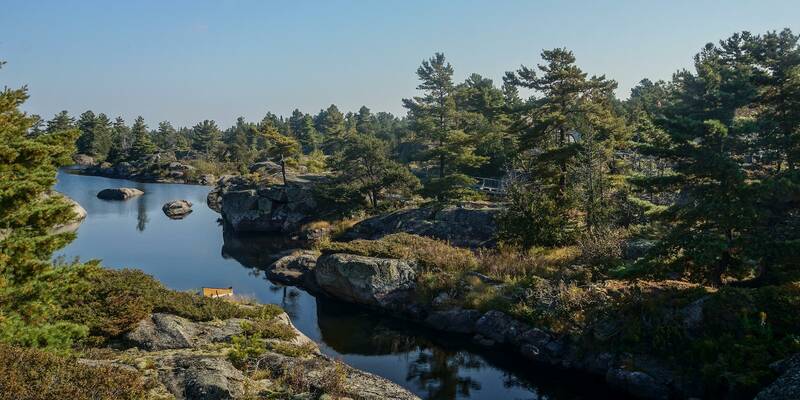 Although the land around Rainbow Camp is privately owned, the tramway [i.e. the boardwalk!] itself is available for anyone to use. 1990’s Federal Govt topo with the boardwalk portage indicated – N.B. no longer in use! Use the signed portages instead. However, some time since 2008 the boardwalk has been dismantled after falling into disrepair. The apparent reason: the owner of the land it crossed was afraid of getting sued by someone who hurt themselves using it. How that fits with Stone’s above comment I am not sure! 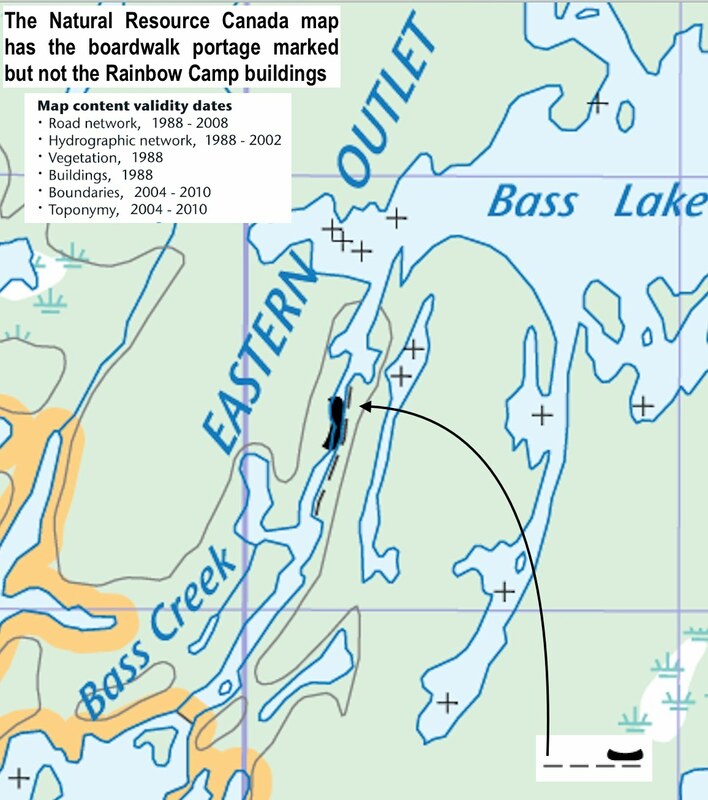 Googling “Rainbow Camp Bass Creek” turns up no information! 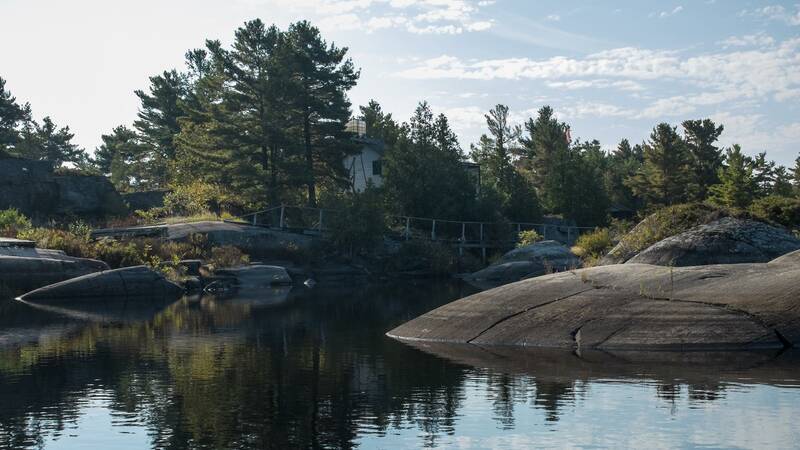 There is a Rainbow Camp on the French River but it is near Noelville on the North Channel on the east side of Highway 69. The Bass Creek property likely has been turned into a private cottage. 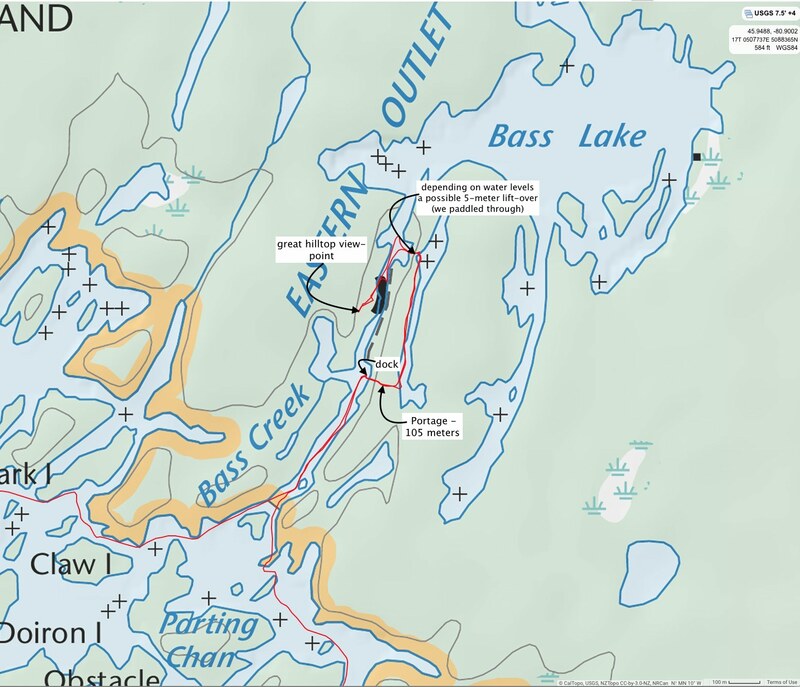 The return trip to the access at Hartley Bay Marina is by way of the Eastern Outlet and the Bass Creek Tramway. This 240-metre boardwalk, originally constructed of rails mounted on large timbers, was first established as a way for the lumber companies to move their mills off Georgian Bay and move them more inland. There is no boardwalk anymore. 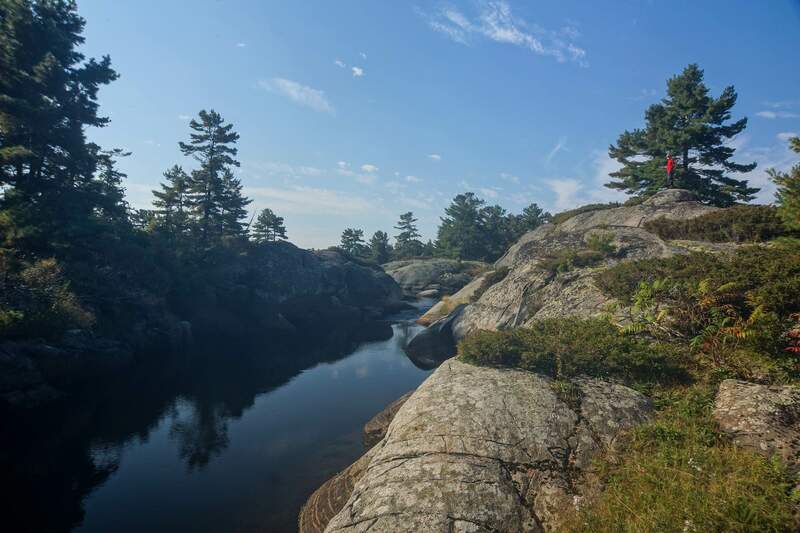 There is one easy portage at the south end and a lift-over at the north end! 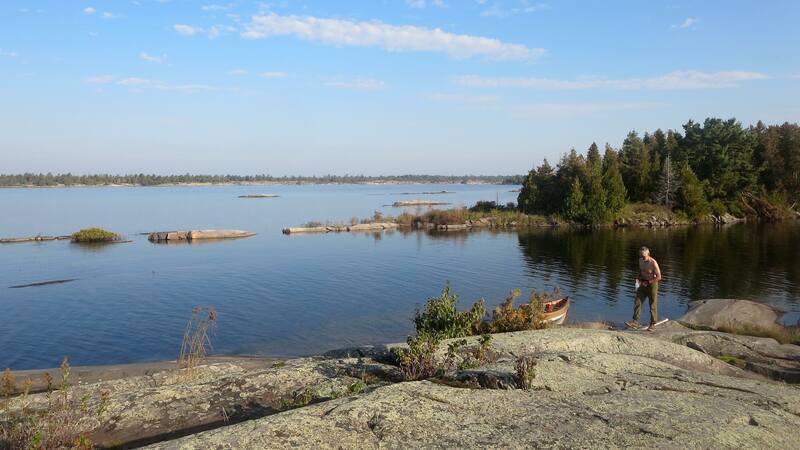 After our carry from the dock, we did the short paddle up the narrow lake to the second “portage”. On the official park map, it is marked as “10 meters”. What we found was a shallow and narrow channel – and maybe the beginnings of a beaver dam! – that we pushed our way up. We may have stepped out of the canoe to move it along. 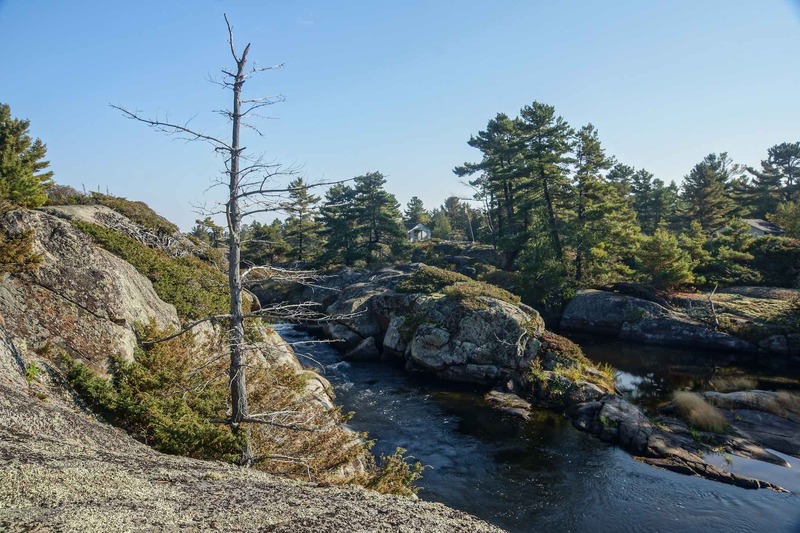 The higher water levels in 2017 – two feet higher, according to locals – explains the missing portage! We were now in Bass Creek again and looking at a collection of signs pointing to the five-meter “life-over” we had just negotiated. Whoever put them there clearly wants you to head for the narrow channel we had just come up rather than looking for a no-longer operational boardwalk! 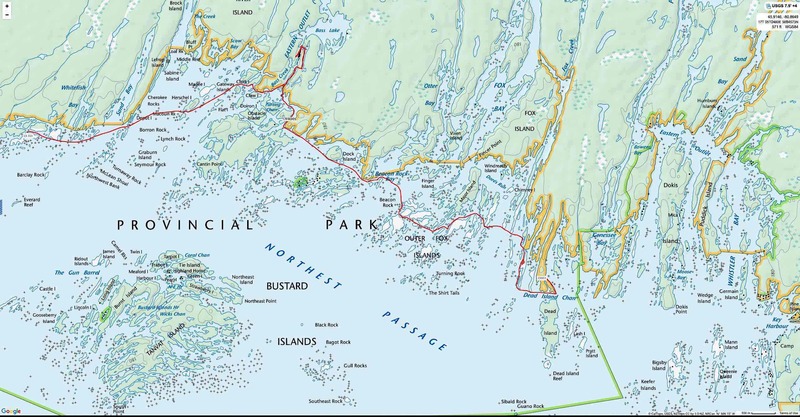 The broken-line trail indicated on that 1990’s vintage Natural Resources Canada topo map above does not help matters! In the image below you can see what may be the remains of some of that boardwalk in front of the cottage. We paddled south on Bass Creek past the property. We really should have stepped ashore and checked out the remains of the boardwalk and snapped some photos but we did not want to annoy the owners. In retrospect, we realize they probably weren’t there anyway! We paddled down the creek and soon beached the canoe and scampered up that hilltop you see in the photo below. Max on top of Viewpoint Rock on Bass Creek – stupendous spot! We spent a half-hour enjoying the views from our hilltop viewpoint and expressed the “wow” concept several times in different ways! This was an unexpected bonus thrown in on top of what was already a fantastic scenic paddling trip. I’m glad we took the time to get out of the canoe and scamper up the rock. Sometimes my brother and I can get too focused on getting those kilometers in! 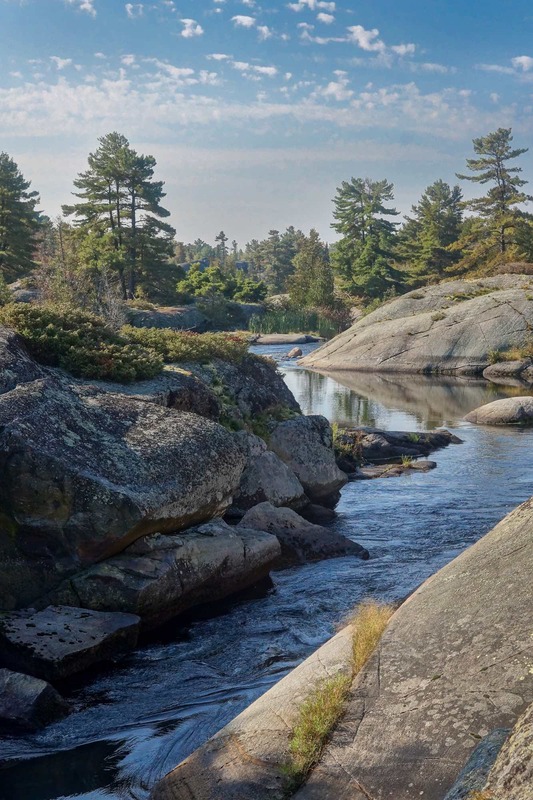 Then it was back the way we came – down the narrow lake through the reedy part at the north end, over the portage trail and back to our canoe packs and duffels which we had left behind – and finally, back down Bass Creek to the Georgian Bay coast. 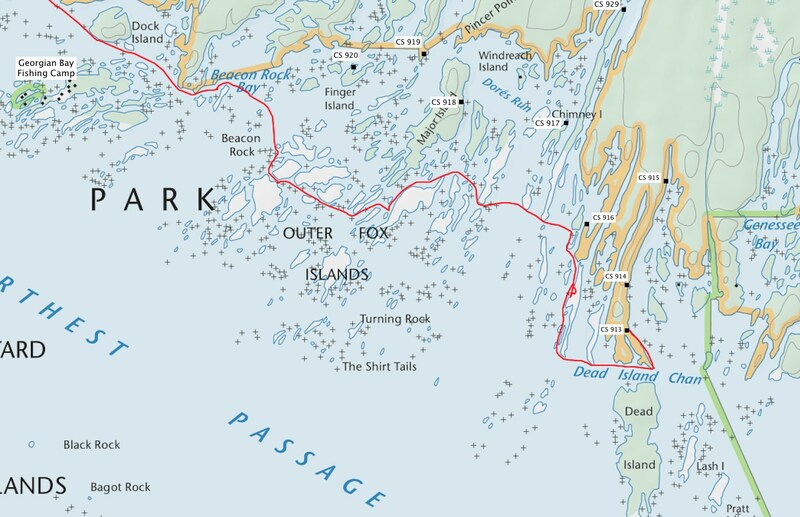 If there is an “easiest” route from Hartley Bay to the Georgian Bay coast, one involving the least portaging, this route down Bass Lake and Bass Creek must be it. Easy for canoers, it would not be that bad for kayakers either. 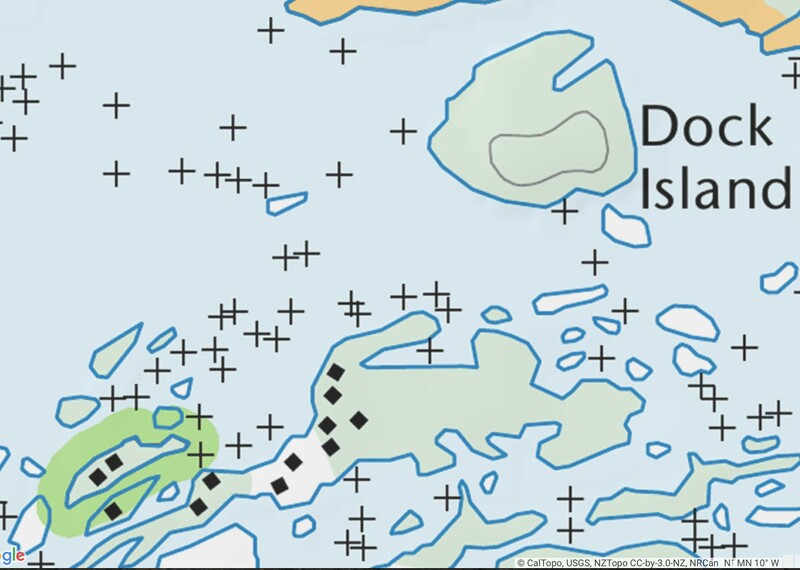 As a bonus, it leads you right to Cantin Point and the shortest crossing over to the Bustard Islands. As we headed east we paddled along the south side of Dock Island and wondered about the dock pictured in the image below and if it was the reason for the island’s name. We looked south and saw the buildings of the Georgian Bay Fishing Camp, a full-service lodge that looks a lot grander than its name! The old dock in your one photo actually drifted over from the fishing camp. The camp has been unused since 2016. Lack of maintenace plus higher water levels allowed it to be set adrift. We soon stopped for lunch in Beacon Rock Bay. Not far away were the Outer Fox Islands. In the image below Max is examining the map for the best way of getting over there for a tour of the small archipelago. Also on our mind was finding a possible campsite on one of the islands if it had some tree shelter and a flat spot for a four-person tent. 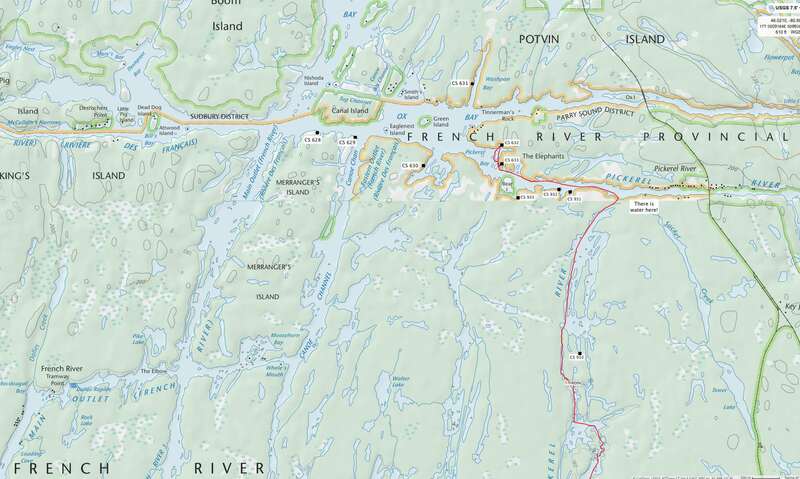 If not, as the map below shows, there were several designated French River Provincial Park campsites that we could check out. 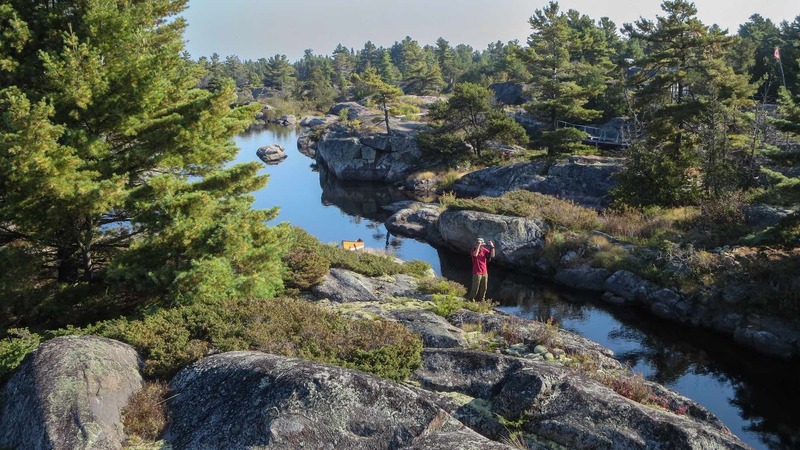 Our visit to the Outer Foxes provided yet more great views and scenic small channel paddling – but, after checking out a couple of likely spots, we did not find our campsite for the night. 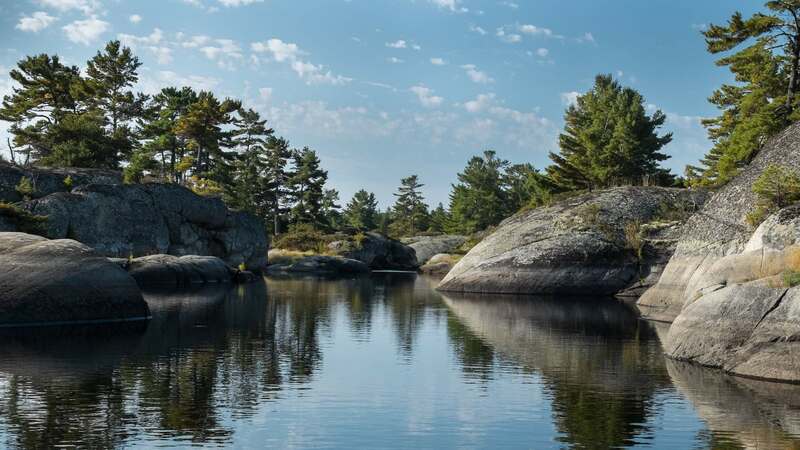 We decided to aim for CS 913, given its location and its proximity to Genessee Bay since the next day we’d be paddling up the Pickerel River. The site proved to be a good choice. It had a sheltered and flat spot for the tent with the earth floor being a bonus. 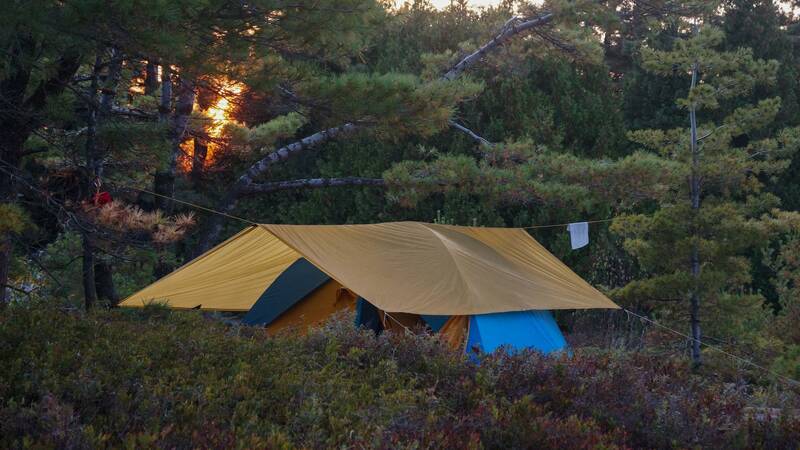 A dozen tents could be pitched nearby depending on how fussy you were! As well, the rock outcrop running along the shore up the bay meant that we could do some exploring later on. 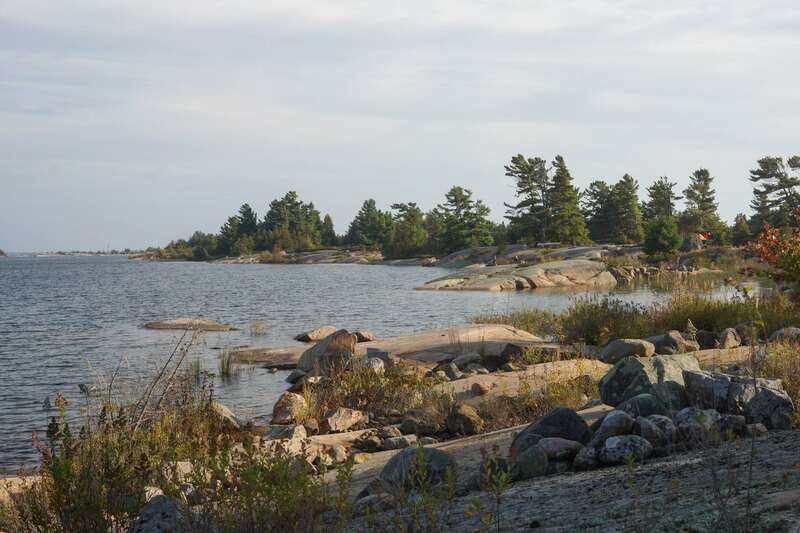 We did walk up the shore of the bay to the next campsite – CS 914. It was not as nice a site and, at first, I could not even see its marker. 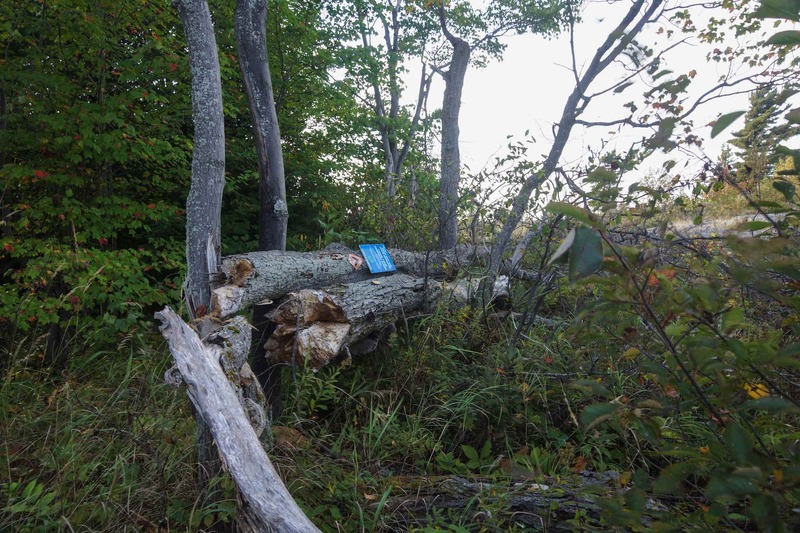 The blue sign finally caught my eye as I looked over at the fallen tree trunks in the photo below. The wind or a beaver – or maybe both – had done the job! 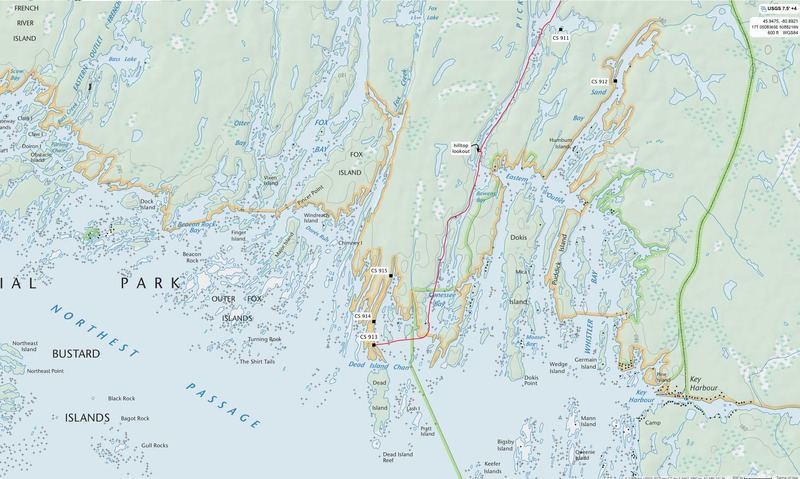 There is a boaters’ channel that runs along the coast. As we sat there and looked out into Georgian Bay we did see two boats make their way between Dead Island and the point we were camping on. It was a Sunday afternoon and we thought it might be busier, especially given our proximity to Key Harbour. However, since it was late September it was much more tranquil than during prime summer. 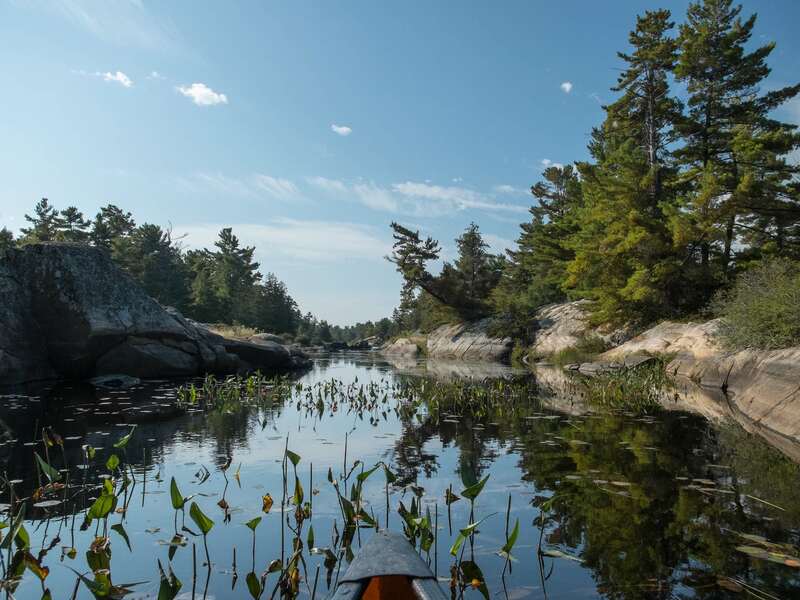 As for fellow paddlers, during our first five days out we had only seen four kayaks – all in one group – and four canoes. We basically had the park to ourselves! At the end of the day, we packed up the food bag and took it for a 100-meter walk down the shore. It has been a few years since we did the nightly “dangling the food bag from the branch of a tall enough tree” ritual. Partly it was because the terrain we were paddling in often did not have the trees required to hoist our forty-pound bag up. These days – no more bear piñata! 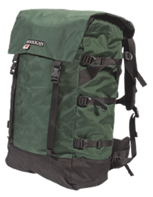 Now, we slip the food bag – one of our two tough nylon Hooligan Canoe Packs – inside a large garbage bag and put a log over it and walk back to the tent. Never an issue since 2012! On tap for the next day was our trip back towards Hartley Bay and our vehicle. While we could easily have done the entire distance in one day, we had decided to stop for the day just a bit short of the end-point. 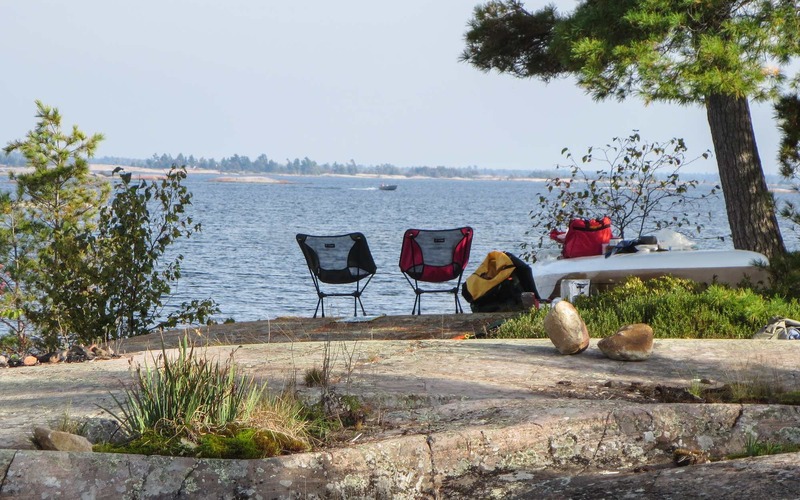 Given the number of campsites in Pickerel Bay, that was what we were aiming for. 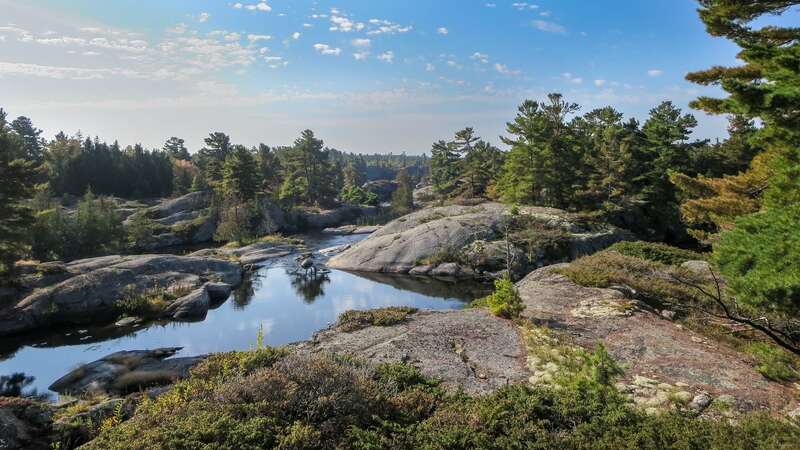 This entry was posted in Georgian Bay, wilderness canoe tripping and tagged Bask Creek Portage, Bass Creek boardwalk, Outer Foxes campsites. Bookmark the permalink. Excellent write-up! Yes, Wow describes the area perfectly. We spend some time up there every year putting around and camping/scubadiving/enjoying the emptiness. 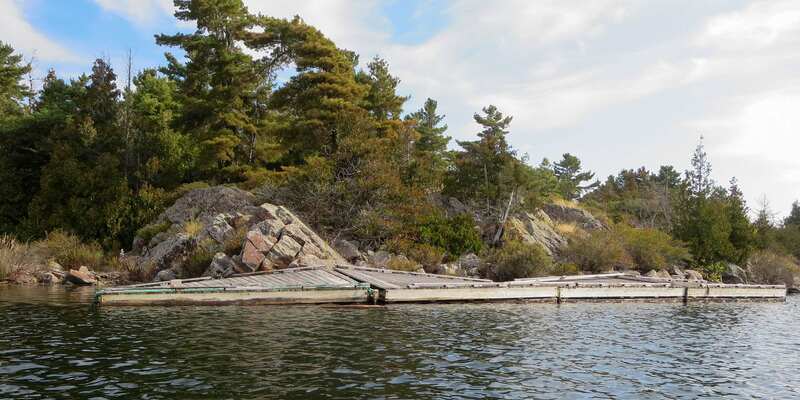 The old dock in your one photo actually drifted over from the fishing camp.The camp has been unused since 2016.Lack of maintenace plus higher water levels allowed it to be set adrift. May you get back up there soon. Bill, thanks for the explanation for how that dock got there! I’ll add your info to the post. We’ll hopefully be back up there this fall! It makes for a nice week-long escape from the 416!